Overland Electric Carts – Making landscaping easy! Overland Carts are manufactured by Granite Industries. Developed since 2009, Overland now represents the top of the motorized cart market. These carts use completely electric drive trains capable of moving 750 lbs while not emitting emissions or noise. Overland electric wheelbarrows and carts have been developed since day 1 to be an all green. The electric drive train uses a powerful electric motor powered by a 24V battery. The electric motor powers the wheels and allows for easy starts even with 750 lbs of load. Overland developed a feature called Smooth-Start which controls the start to ensure controlled take off each time. The electric motor allows for use indoors, outdoors or in green houses. No need to worry about fumes as the Overland cart is emission free. Overland has intentionally sourced nearly all the cart components from the USA. The hopper comes from the wheelbarrow industry leader, Brentwood, located in Pennsylvania. Made from high quality UV test high-density polyethylene, this polymer is 50% lighter than a comparable steel bucket and does not have the risk of rusting. Overland electric wheelbarrows are virtually maintenance free. There are no oil changes or air filter changes. The lack of chains and belts increase safety and also reduce downtime. Clean up can be done in about 30 seconds with a hose or water bucket. Cement, dirt or mud, it all washes away leaving the electric wheelbarrow looking brand new. Overland electric carts make even the most exhausting project seem easy. Capable of moving 750 lbs on a level surface or 500 lbs up an incline, these carts will save trips and your back. 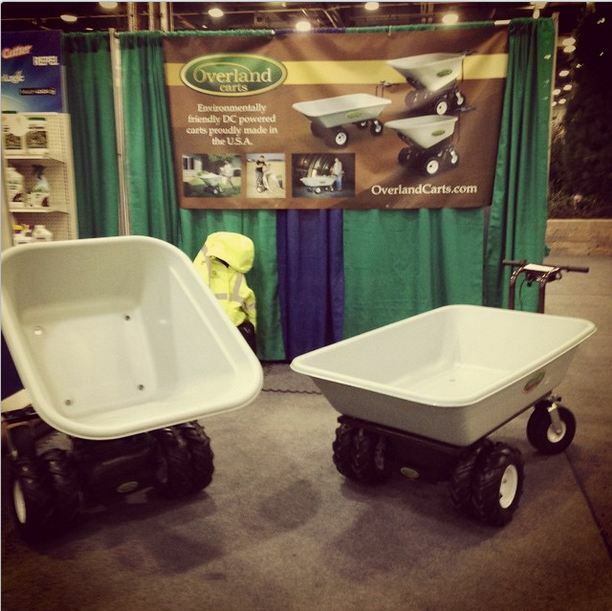 Fertilizer bags, top soil, plants, water buckets, or whatever else you can dream of, the Overland cart can handle it. Used in the industry for years now, we have heard plenty of positive feedback from happy landscapers!